First Kings 8 records the dedication of the magnificent Temple that King Solomon built for the worship of God in Jerusalem. The construction of the First Temple is considered even today as one of the greatest highlights in Israel's history, the crowning achievement of Solomon's reign and a true wonder of the world until it was destroyed by the Babylonians about 400 years later. The Ark of the Covenant finally had a permanent home. The ceremony was as awe-inspiring as the Temple. We can imagine Jerusalem beautifully decorated and bursting at the seams as the entire congregation of Israel gathered for the occasion. They were not disappointed, because the cloud of God's glory filled first the Holy Place, the inner room of the Temple, and then the entire Temple as the Ark of the Covenant was placed there. Jerusalem's status as the holy city was dramatically confirmed that day! The Ark was carried to the Temple by the priests using long carrying poles, as God had instructed. Why is this detail important? Why was it important that all the people of Israel (vv. 1-5) participate in the dedication of the Temple and the worship surrounding it? With the exception of the Ark of the Covenant, it appears that every utensil and piece of furniture in the Temple was new. Why do you think the old utensils and furniture were set aside? Verse 16 makes it clear that God chose Jerusalem as the dwelling place of His Temple and His holy name. How should we view the city of Jerusalem today? Even though Solomon's great Temple is no longer standing, visiting the holy city of Jerusalem is still a life-changing experience. 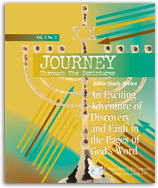 Why not consider the possibility of making your own pilgrimage of faith to Jerusalem? The Fellowship offers regular opportunities to visit the Holy Land, and many of our friends have told us how God provided for their trip in amazing ways. If you are unable to visit, consider studying books and watching programs that show the religious significance of the city.